The Slowly Boiled Frog: NOM: "President Trump Needs to Get Moving on Religious Liberty"
The issue of religious liberty is one of the most important for people of faith, who happen to be the key voting block most responsible for electing Donald Trump as president. Evangelicals voted over 80% for Mr. Trump, and Catholics went for him by 52%. Now it's time for the administration to act to protect people of faith from being discriminated against because of their faith. Isn't he special? Brown overlooks the fact that a majority of our citizens voted for Hillary Clinton (by nearly three million). Without some help from Comey and Putin, it would have been much more. Trump's approval is now under 40%. That is quite an accomplishment for someone who has been in office only a month. Furthermore, the idea that people of faith are being discriminated against is ludicrous unless you define discrimination for them as somewhat curbing their ability to discriminate against LGBT people. President Trump's aides have prepared an important Executive Order for the president to sign that will prevent the federal government from discriminating against people of faith. Under former President Obama, people of faith were denied access to government contracts, Christian colleges were threatened with having their accreditation stripped over things like student housing policies, and nonprofit groups were threatened with loss of tax exempt status for failure to endorse the agenda of LGBT extremists, among other forms of discrimination. Presidential spokesman Sean Spicer said the other day that protecting religious liberty is an important priority, which we commend him for saying, but so far President Trump has not acted by signing the pending Executive Order. Brown is referring to that leaked executive order. We have no idea who prepared it. Prior to the leak, Trump had already extended President Obama's executive order protecting LGBT citizens from discrimination in the federal workplace and by government contractors. Trump is erratic for sure but does Brown really expect him to reverse his policy after only two weeks? Much of this is just BS. No Christian College has been threatened by the government with having their accreditation stripped. That is impossible because accreditation is granted by private organizations. Furthermore, no non-profit organization that I know of was threatened with a loss of tax-exempt status for “failure to endorse the agenda of LGBT extremists.” That goes beyond hyperbole. That is a flat-out lie. 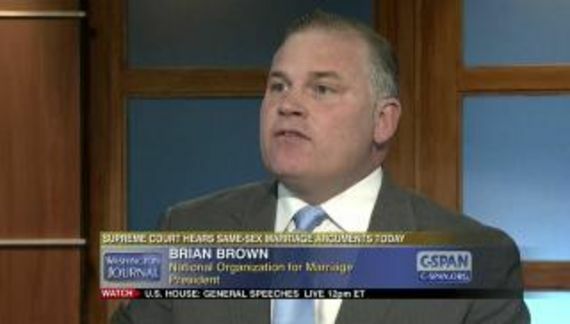 As NOM's finances have plummeted, Brian Brown has found it increasingly easy to lie. There is no “pending executive order.” A draft (let alone one of unknown provenance) does not create a pending order. NOM is formally calling on President Trump to act in support of religious liberty by signing the pending Executive Order. We are preparing a new communications push aimed at encouraging President Trump to act. 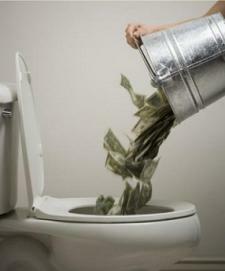 But to be successful, we need additional resources to devote to the effort. Will you help? “Formally” mind you. Of course the rest of the email is begging for money. Exactly what NOM proposes to do with that money to advance an executive order that they want is unknown. They'll probably send out more email asking for more money. Come to think of it, does NOM actually do anything other than ask for money? They seem to ask for money to stay alive so that they can ask for more money.